This is a post previously published by myself on a short-lived book blog. 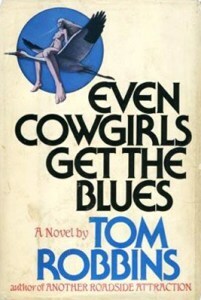 I think it’s important for everyone to go through a Tom Robbins phase in their life. I read six of his novels in a row and totally burnt out on the philosophically bizzarre/sexual scenarios that also try to propagandize the free-love way of life. But this was the first book of his that I read, and I still keep a beat up copy of it on my bookshelf. All I had to do was read the ridiculous opening dedication to the amoeba, and I was hooked. The plots in Robbins’ books are nonsensical and hokey and have limited structure. This book is about Sissy Hankshaw who is born with exceptionally large thumbs. What else can she do but become a hitch hiker and cowgirl to boot? One of my favorite lines comes from our heroine Sissy when the Countess asks her what she is proving by hitch hiking her life away. She replies, “I’ve proven that people aren’t trees, so it is false when they speak of roots.” I’m waiting for the day when I can say that to someone.